With a year-round average temperature of 89 degrees and water so turquoise it looks fake, there are few better places than Aruba for a relaxing, sun-soaked vacation. But stray from your resort and you'll find an island that also caters to environmentalists, adventurers, and animal lovers. Aruba’s off-roading tours are a fantastic way to discover the unique terrain and natural wonders of this fascinating island. 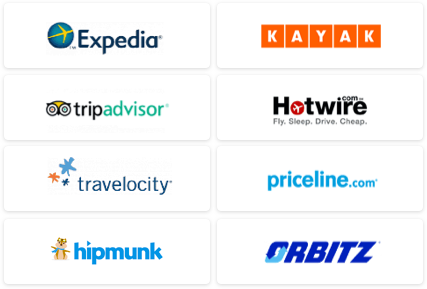 It’s easy to book an off-roading tour through the concierge at your hotel; popular companies include De Palm Tours and ABC Aruba Tours. 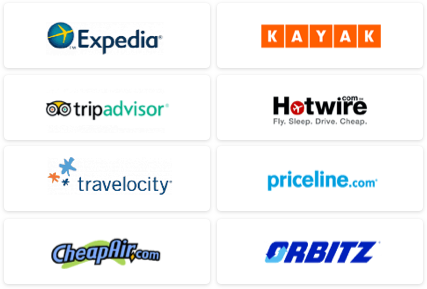 Both companies pick you up from the main entrance of your hotel and cost around $100 for a full-day tour (between six to eight hours). Our tour guide, Rocky Junior, arrived in a bright yellow Jeep at nine in the morning. He suggested we finish our cups of coffee quickly; things could get messy otherwise. Sure enough, after the first ten minutes, we had crossed over from Palm Beach, the flat resort stretch of Aruba, to Arikok National Park, which covers about a fifth of the island. There are no roads, per se, throughout Arikok, which indeed meant a winding, bumpy ride over dormant volcanoes, with gorgeous views of the Caribbean below. Rocky Junior explained to us that Aruba emerged from the water as an active volcano some 95 million years ago. It’s also only 12 degrees from the equator, creating an arid terrain of endless cacti. We continued north for photo ops at Wariruri Bay, an inlet with tall rock outcroppings and crashing waves that are popular with local surfers. In the distance, we spotted fellow tourists trotting through the park on horseback – another great way to explore the island, and available to novice and advanced riders alike. Next we traveled to the Guadirikiri Cave. As we climbed into the dark, cramped entrance, half of our group made a bee-line back out into the sunshine; this spot is not for the claustrophobic. As Rocky Junior led the rest of us by a single flashlight (and we all tripped over our own feet), we heard the squawking of bats in the distance. He turned off the flashlight, and had us cover the lights of our own cameras then, by clapping his hand, Rocky motivated the bats to fly en masse directly above our heads. Then he told us pull out our cameras – fast. I shot furiously, and later my photos revealed hundreds of bats gathering overhead. Back in the light, we made our way to see much different animals. Donkeys are not native to Aruba, though they were used as the primary mode of transportation on the island for 500 years. Once they were replaced by cars, they could no longer survive in the arid climate without human intervention. 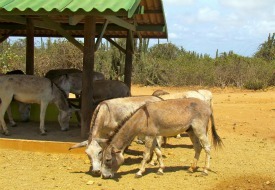 The Donkey Sanctuary Aruba was created as a safe haven for them, and visitors can enter free of cost and roam the grounds with these happy, peaceful animals. Finally, we arrived at our last stop: Baby Beach. We strapped on our snorkel gear and swam far past the shore to spot some of Aruba’s most beautiful underwater life. Rocky Junior tore up pieces of hot dog buns to lure bright blue and yellow parrot fish, who swarmed us on all sides. It was incredible to be immersed in the clear water and surrounded by these beautiful animals – though I can’t say I enjoyed when they mistook my fingers for hot dog buns. Even though I had plenty of time to relax and unwind at the beautiful Aruba Marriott, it was great to get off-site for a day and explore some of the natural wonders of the island. I highly recommend an off-roading tour for anyone interested in a unique and adventurous experience during their next trip to Aruba. See our Aruba destination guide for more trip-planning information, then use our Travel Search price comparison tool to find the lowest rates on flights.